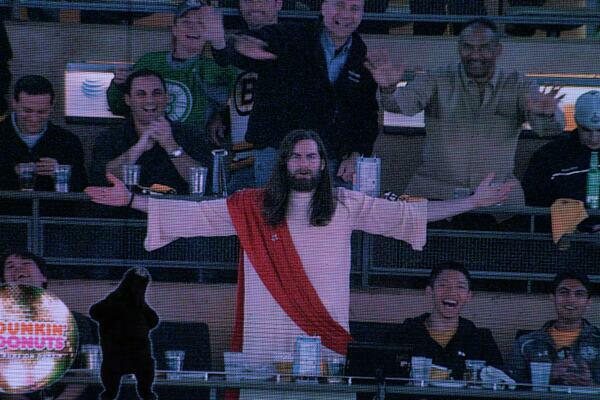 Christ was also booed during his appearance at Boston's 4-1 win over Detroit on Sunday. BOSTON, April 21 (UPI) -- There was a special guest at TD Garden on Sunday supporting the Bruins in their attempt to resurrect their Stanley Cup chances against the Red Wings after falling behind in their best-of-seven series -- Jesus Christ. After losing Game 1 to Detroit 1-0 on Friday, Boston needed a win on Easter Sunday to get back on track. Although JC (actually a guy named Thor) may have been pleased with the Bruins' 4-1 victory, he can’t have been all that happy with some other things that happened during the game. The Bruins and Red Wings will play Game 3 in Detroit on Tuesday night with the series now knotted up at 1-1.